Roasted coconut chicken curry or Thenga varutharacha kozhi curry is an all-time favorite dish for Keralites, especially in Malabar. This chicken dish is usually served along with Malabar nice pathiri or Malabar ghee rice. Pathiri and varutharacha kozhi curry is an evergreen combination for each Keralites. 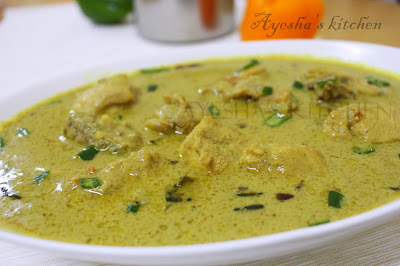 During Ramadan, all households in Malabar region will be engaged in making this delicious aromatic curry and nice pathiri or aripathiri for iftar. 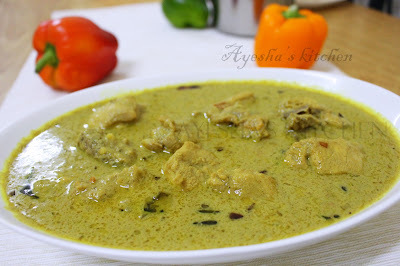 This is a delicious chicken curry with a thick gravy of roasted coconut and other Kerala traditional spices which gives a rich and aromatic flavor to this curry. It could be made in different versions, but am here sharing the recipe of my native place Malappuram, Calicut version of varutharacha chicken curry...Do enjoy!! Marinate the chicken with 1 tsp turmeric powder and salt. Keep it aside for 10 minutes. Dry roast one cup of grated coconut, shallots, fennel seed, curry leaves, 1 tsp coriander powder in a very low flame till it becomes crispy or golden color. Keep it aside. Saute till tomato is done and now add the marinated chicken. Do not add water. Let it cook for few minutes with lid closed. Then add coriander powder, half tsp turmeric powder and salt (if required). Mix well and cook until the chicken is half done. Now grind together the roasted mixture along with milk and the remaining half cup of raw grated coconut to a fine paste. Add water required for grinding. Grind well until a fine paste. Pour it over the chicken gravy and let it cook in a medium flame for 10 minutes or till the oil separates. Heat another pan and fry chopped shallots along with curry leaves and chopped coriander leaves for seasoning. Pour it over the curry and serve hot with Kerala rice pathiri, Neypathil,Paratta, Chappathi.......Really, It is Delicious..!!!! Please SUBSCRIBE my channel Ayeshas kitchen for more Ramadan special videos.